Our master wood carvers and carved you custom dining table and chairs with any design you can dream. These are high relief, hand carvings with a level of detail that cannot be achieved using any machine. 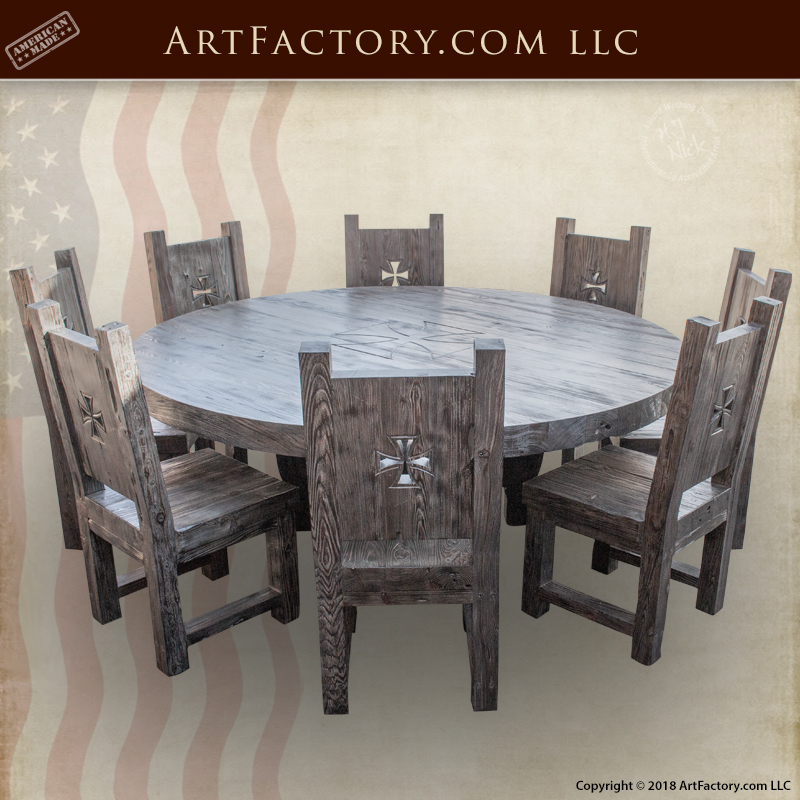 At ArtFactory.com, we offer hand built custom wooden dining tables of historic accuracy built to your dream decor. This round castle dining table can be purchased individually, or as a set with the matching chairs. It features an a rustic design, with a weathered raised grain wood effect, and a unique, ox yolk style trestle. In the center of the table, a large Knights Templar Cross has been expertly carved into the wood by the hands of our master carvers. The matching chairs each feature a Knights Templar Cross carved into the chair backs. This symbol gives your round castle dining table a truly regal appearance. We can carved your table with any design or theme that you can imagine. Like all of our wood furnishings, this dining table is handmade from all natural, air dried, full length timber. We build our dining room furniture using genuine exotic woods. Fine furnishings are never built with faux woods, particle board, or veneers. That's why when we say solid wood, we mean "The Real McCoy". In addition to top quality materials, all tables and chairs are hand hewn, pegged, doweled by master craftsmen using mortise and tenon joinery. This type of materials and craftsmanship makes for dining room furniture that will stand the test of time. Our solid wood tables are built to be heirloom quality that can be passed down, and treasured by your family. In fact, our combination of top quality materials and master craftsmanship allow us to offer a quality of product that is unmatched anywhere, at any price. All of our custom dining room tables and chairs are available individually, or as a complete matching set. We also build matching China cabinets, hutches, for those looking to create a complete, matching kitchen. Building dining room furniture as a family legacy has been going on since the beginning of time. Building heirloom furniture intended to last forever is one of the primary ways we all have in achieving some small part of immortality that will touch our loved ones for many generations. In the same way, many societies such as the Egyptians, Mayans, and many kings and queens, as well as the European aristocracy have created and passed down heirlooms for thousands of years. In fact, if it were not for the artifacts found, it would be impossible to know these people ever existed, and how they contributed to a better and art filled world for mankind. This is also the case in the 21st century within your own family. No matter if it's a simple fine art, handmade, one-of-a-kind placard, hope chest, etc. with your personal message or name as a gift to a loved one, or a major hand crafted, fine art, round castle dining table and chairs commemorating your personality and accomplishments. We specialized in creating heirlooms for your family that will be cherished for generations. That has always been our business since 1913. This furniture is built to last forever using the finest craftsmanship in the world and the finest materials. Not only is this an investment quality piece and an appreciable asset that will add to your financial net worth. True artifacts enhance and enrich all of our lives in a way that mass-produced merchandise never will, thus preserving the best of man kinds creativity and expressing our love for each other. We use the finest quality, genuine, solid timber, because fine art is never made with low quality faux materials. When we say wood, we mean "The Real McCoy". We finished this round castle dining table, and all of our fine art furnishing using a many step infusion process. These finishes are hand rubbed, with curing times between each process. This include multiple applications to blend the stain into the grain of the wood, with multiple coats of lacquer applied over the stain. We offer hundreds of different finish color choices. Unlike paint, these finishes will not fade, flake, or chip over time. All of this adds up to a finish that meets world class fine art specifications, and will stay beautiful for generations with little or no maintenance. Every product from ArtFactory.com is designed by, and built under the supervision of award winning artist H.J. Nick. Before any product leaves our world class factory, is personally inspected and signed by H.J. Nick. This signature is to assure that the quality and craftsmanship have been found to meet all world class fine art qualifications. Our master woodworkers handcraft all custom furniture to your design specifications. We only use the highest quality materials. All of our wooden furnishings, doors, and gates are made from solid, full length, naturally air dried timber. We believe in the quality of our products so much, that as result, our dining room furniture and all of our products are guaranteed forever. Call now for pricing on this round castle dining table at 1-800-292-0008. All of our custom furniture products are handmade in the USA, in our Scottsdale, Arizona factory. The Poor Fellow-Soldiers of Christ and of the Temple of Solomon (Latin: Pauperes commilitones Christi Templique Salomonici), also known as the Order of Solomon's Temple, the Knights Templar or simply the Templars, were a Catholic military order recognised in 1139 by the papal bull Omne datum optimum. The order was founded in 1119 and was active until about 1312. The order, which was among the wealthiest and most powerful, became a favoured charity throughout Christendom and grew rapidly in membership and power. They were prominent in Christian finance. Templar knights, in their distinctive white mantles with a red cross, were among the most skilled fighting units of the Crusades.